Community services are a key component of economic development, sustainable employment and social cohesion in the 21st Century. Over 200 people, including Paul Singer, Secretary of State for Solidarity Economy under the Ministry of Labour and Employment of Brazil and Roberto Rodrigues, ex-President on the International Cooperative Alliance (ICA), participated at the workshop Access to Community Services organised by CICOPA, the international organisation of cooperatives in industry and services, and IHCO, the International Health Cooperative Organisation in Cape Town (South Africa). There are pressing needs for community services all over the world, and cooperatives are increasingly becoming involved in them. This session has presented several concrete examples of cooperatives providing community services from countries such as Argentina, Japan, Brazil, USA and Spain. The workshop shared the main global trends regarding cooperatives engaged in community services (health, education, housing, environment, social services and the labour integration of disadvantaged citizens etc,) with the help of international experts and examples of cooperatives in the field. The workshop has shown that the cooperative movement, through democratically controlled business operations, has already begun to meet the challenge of satisfying community service needs in a more intensive manner over the last few years. Cooperatives often provide higher quality and improved cost efficiency compared to other delivery patterns, according to a number of studies. The cooperative model, especially when several stakeholders are involved in its democratic control governance system, is particularly well adapted to community services, because it is virtually the only one that can fully empower the various local actors involved in the activity through joint and democratic control, while implementing such activities in a strictly entrepreneurial fashion. As a matter of fact, around the world, at least 12,600 cooperatives active in the provision of social services and according to data available 2,100 schools are run as cooperatives. The session was concluded by the President of CICOPA, Manuel Mariscal, and the President of IHCO, Jose Carlos Guisado who agreed in the closing message, underlining that cooperatives are the answer to social needs. 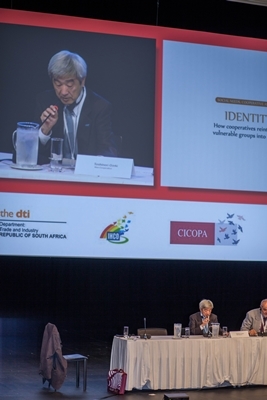 Access to Community Services has been organized in the framework of the global meeting of the cooperative movement that took place in Cape Town on early November.